Preheat the skillet at setting 8 until heating light turns off. Lightly sauté chorizo, tomatoes and spinach, and remove from the skillet. Wipe the skillet out and reheat. Place eggs and milk into a bowl and whisk with a fork for 1 minute. Add butter to the preheated skillet and pour eggs. Top one side with spinach, chorizo mix and cheese. Cook for 5 minutes. 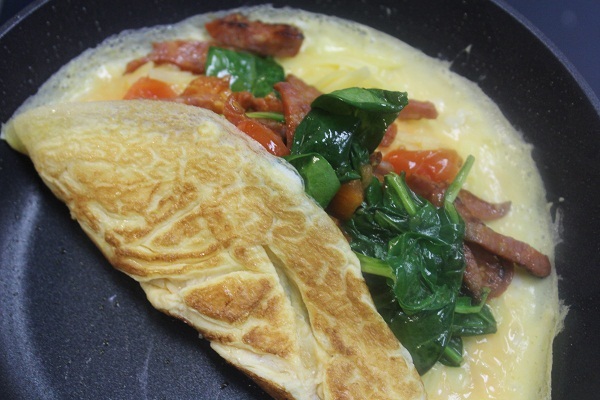 Flip empty side of omelette onto the filling and lift out of skillet with a heat resistant spatula.